Investors are concerned about inflation. But how can investors attempt to inflation-proof their portfolios? Buy TIPS? Short Treasury bonds? Stocks? Real Estate? Commodities? Gold? Currencies? 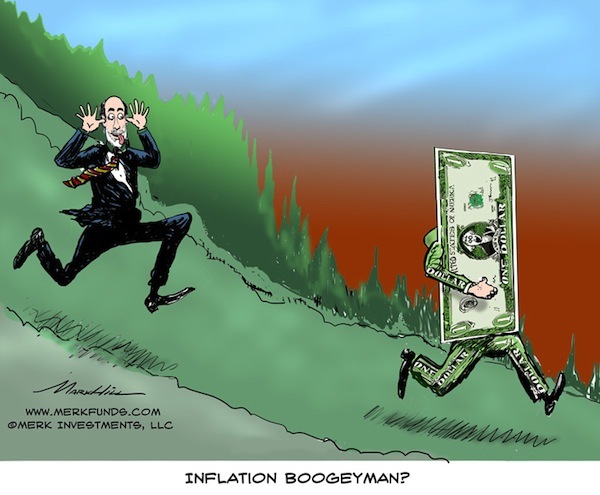 Or should investors regard those warnings about inflation as fear mongering? Indeed, as the Federal Reserve (Fed) announced its latest round of quantitative easing (“QE3”), gauges of future inflation expectations spiked. In our assessment, the market reacted strongly as it became apparent that the Fed is moving away from its focus on inflation to a focus on employment. We believe the Fed wants to raise the price level so as to bail out millions of homeowners that are ‘under water’, i.e. owe more on their homes than they are worth. Fed Chair Bernanke considers a healthy housing market to be key to healthy consumer spending (see our Merk Insight Don’t worry, be Happy). Judging from the market reaction to QE3, fears about future inflation are warranted. Having said that, market fears about looming inflation have calmed down a bit since the initial flare up. Could it be this calming of the market is due to the fact that the Fed is intervening in the TIPS market? TIPS are “inflation protected” Treasury securities that are linked to the Consumer Price Index. Investors buying TIPS do so in the hope that their purchasing power might be protected. When the Fed intervenes in the market to buy TIPS (or any other security for that matter), such securities are intentionally over-priced, raising doubt as to whether investors are truly “protected” from inflation. It’s not just investors that now have more limited access to measuring inflation expectations – it’s also the Fed itself. By managing the entire yield curve (short-term through long-term interest rates), we believe the Fed has blindfolded itself, as it has taken away one of the most important gauges about the health of the economy. Aside from the Fed’s intervention in the TIPS market, the government is free to change the inflation adjustment factor employed in TIPS before the securities mature. TIPS payouts are adjusted using the consumer price index (CPI), which has seen methodology changes many times. When the recent debt ceiling impasse was discussed, both Republicans and Democrats talked in favor of changing the CPI definition so that it would nominally live up to inflation linked entitlement promises while clearly eroding the purchasing power of such payouts. Even without such gimmickry, the CPI may not be reflective of the basket of goods and services consumed by investors as they approach retirement given, for example, that healthcare may comprise an ever-increasing part of one’s spending. Alas, much of investing is about trying to preserve purchasing power and, alas, buying TIPS may not provide adequate protection. If one is negative about the inflation outlook, why not simply short Treasuries, either directly or through ETFs? While we are pessimistic about the long-term outlook of Treasuries, it can be very costly to short them, given that – as a short seller – one has to continuously pay the interest of the securities one shorts. If one buys an ETF shorting Treasuries, the cost of the ETF is to be added. Shorting Treasuries might make sense for investors that are good at market timing. However, calling the top in major bubbles is rather difficult, just reflect on former Fed Chair Alan Greenspan’s “irrational exuberance” speech years ahead of the stock market collapse in 2000; similarly, those that saw the bubble in the housing market coming didn’t necessarily get the timing right. If TIPS don’t provide enough bang for the buck, and shorting Treasuries can be costly, what about buying stocks? Bernanke appears to use every opportunity possible to praise the benefits QE has on rising stock prices. While we agree that QE has pushed stock prices higher, it may be dangerous for the Fed to praise this link given that it raises expectations of more Fed easing whenever the markets plunge (see Merk Insight: Bernanke Put). For example, how many investors buy Cisco 1 shares because of the great management skills of CEO John Chambers as compared to those who buy because of QE3? We pose this question because stocks are rather volatile; not only are stocks volatile, but the volatility of stocks can be all over the place. Historically, the annualized standard deviation of the S&P 500 index hovers in the mid 20% range, with outbursts into the 40% range in 2008. So why are investors taking on the “noise” of the stock market, when the reason they invest is because of QE? Indeed, our analysis shows that investors appear to be ever more chasing the next perceived intervention by policy makers rather than investing based on fundamentals. That’s not only bad for capital formation (these misallocations are summarily referred to as “bubbles” these days), but also suggests that we might want to look for a more direct way to take a position on what we call the “mania” of policy makers. Talking about policy makers: you might not agree with them, but if there is one good thing to be said about our policy makers, it is that they may be quite predictable. What about real estate? In the U.S., depending on where one lives, the real estate market has bottomed out or appears to be bottoming out. With what appears to be the Fed’s razor sharp focus on real estate, it might be foolish to bet against the Fed. Indeed, yours truly bought a property in Palo Alto in late 2009. Unlike other real assets, keep in mind that real estate is often purchased with borrowed money; as such, it is prone to speculative bubbles such as the most recent episode. Investing in REITs might allow one to allocate a smaller share of one’s portfolio to real estate; a downside of REITs is that they tend to be highly correlated with equity markets. As policy makers steer equity prices, everything appears to be ever more highly correlated, investors may want to look for something that offers low correlation to other investments. That brings us to commodities. In a world where policy makers appear to favor growth at just about any cost, commodity prices have been beneficiaries. As we have seen in recent weeks, it is not a one-way street, as dynamics within the market can be rather complex. The dynamics for commodities within agriculture differ from those in metals or energy. There are special considerations in storing and delivering many commodities, creating challenges for investors. We agree that commodities might do well in the long run, but urge investors to consider all the risks that come with investing in commodities. Notably, commodities can have stretches of low volatility, luring investors to jump in, only to be greeted with a jolt that can be rather hazardous to one’s wealth. As a simple rule of thumb: if you can’t sleep at night with your investment, you own too much of it. Gold is worth singling out as the one commodity that has arguably the least industrial use. Rather than writing gold off as a barbaric relic, we like gold: its relative simplicity might make it the investment purest in reflecting monetary policy. In the medium term, we believe gold may be a good inflation hedge. But, again, keep in mind that price movements can be rather volatile. Even staunch gold bugs rarely have all their assets in gold. This leads us to currencies as a potentially attractive way to diversify beyond gold. The Chinese have long diversified their reserves to a basket of currencies, in an effort to mitigate their U.S. dollar exposure. Some say currencies are difficult to understand. We argue that it is far easier to understand the dynamics of ten major currencies, as well as others worth monitoring, than to understand the dynamics of thousands of stocks. Importantly, we believe the currency markets might be an ideal place to take a position on the mania of policy makers. Indeed, as we believe that the Fed might want to debase the U.S. dollar (Please see Fed may want to debase dollar), why not express that view in the currency markets? Unlike their reputation, currencies are far less volatile than equities: if one does not employ leverage, a move in the euro by 1 cent is rather small on a percentage basis. The U.S. dollar index has historically had an annualized standard deviation of returns in the low teens; in 2008, that volatility rose a tad, approaching the mid-teens. For investors looking for predictability on the risks in a portfolio, the currency markets have historically shown a far more consistent risk profile than equities or many other asset classes. A corollary is that during market downturns, unlevered currency strategies may offer some downside protection given the lower risk profile. This clearly doesn’t mean an investment in currencies is safe; but managed currency risk can be seen as an opportunity given the purchasing power risk taken by holding U.S. dollars. If investors agree that the Fed: a) may want to have – or at least accept - higher inflation; and b) may not readily see the warning signs of higher inflation, then it appears to us prudent to take the risk of higher inflation into account. Indeed, for those managing money on behalf of others, it might be their fiduciary duty to take that risk into account. Those that ignore the risk of inflation might do so at their own peril. Many investors might feel they can take action once inflation is obvious. “Obvious” is in the eye of the beholder: just as we preferred to be early in warning about the crisis in 2008, it appeared rather challenging to reposition one’s portfolio in October 2008. Gold has gone up by a factor of about 7 since its lows. The dollar has fallen relative to a basket of currencies over the past 10, 30 and 100 years: in our assessment, we simply have the better printing press. Hedging inflation risk isn’t about being right about the future; it’s about the risk of being right. 1 This is not an investment recommendation to buy or sell CSCO, we don’t own CSCO.